So who are the Salafists and what would their rise mean for Egypt? The Salafi movement, based in Alexandria, first gained significant support in the 1970s as an alternative to the Muslim Brotherhood’s increasingly political role in Egyptian life. Mubarak often found it useful to use the Salafi movement as a foil against the Muslim Brotherhood during his three decades in power — after all, Mubarak would obviously favor a movement that eschewed direct engagement in politics. An exclusively Sunni movement, they would likely be even more hostile to Shi’a Muslims than the Morsi administration has been, and they would likely take a harder line against Iran’s Islamic Republic than the more balanced approach that Morsi favored. First, their interest in correct interpretations of texts and following appropriate practice trumps all other concerns. (I have sometimes heard ‘textualist’ — nususi — used as a synonym for Salafi). In contrast to the more freewheeling approach of Islamists, with their willingness to admit many interpretations as plausible, Salafis strive to find the best possible (and therefore correct) reading and apply it to personal behavior. Second, Salafi movements tend to be far less formally organized as a matter of choice. Third, they tend to be much less committed to involvement with the broader society. But the Al-Nour Party has strayed far from all three of those general characteristics since the Egyptian revolution began, and it’s shown a surprisingly canny approach to engaging Egyptian political life. Although the Al-Nour Party ultimately backed Morsi in the runoff against former Mubarak air force chief Ahmed Shafiq in the June 2012 presidential race, it initially supported Abdel Moneim Aboul Fotouh, despite the fact that Aboul Fotouh, a former Muslim Brotherhood member, was running as a more moderate Islamist than Morsi willing to bridge the worlds of Islamists and liberal reformists. Furthermore, despite the strictest interpretations that would otherwise forbid traditional Western lending practices, the Al-Nour Party has proven equally flexible with respect to providing conditional approval to a loan from the International Monetary Fund to shore up Egyptian finances. Nonetheless, there’s really no way to know how a Salafist government, once in power, would try to rule. Morsi and the Muslim Brotherhood, after all, came to power promising a broad-based and inclusive government, though it became increasingly Islamist in its outlook and increasingly narrow in its outreach. In the last set of parliamentary elections held in Egypt at the end of 2011 and the beginning of 2012, the Muslim Brotherhood’s Freedom and Justice Party (حزب الحرية والعدالة‎) won 37.5% of the vote and the largest bloc (235) of the 498 parliamentary seats, but the Al-Nour Party won 27.8% of the vote and 123 seats. No other political party in Egypt at the time won more than 40 seats. The Al-Nour Party isn’t quite as united as it was back then, though, with Salafists divided during the Morsi administration over the appropriate level of support for an Islamist president and now, also divided over whether to back the Egyptian military’s actions last week. 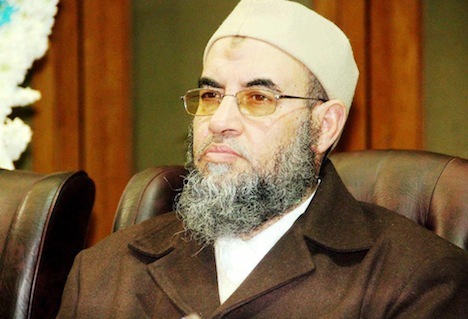 Former Al-Nour Party leader Emad Abdel Ghaffour had increasingly clashed with Yasser Al Borhamy, one of the Salafi movement’s most important spiritual leaders, and Ghaffour left the party in December 2012 to start his own competing faction, the Al-Watan Party (حزب الوطن‎, Arabic for ‘Homeland Party’). Ghaffour, who had been appointed as a Morsi advisor on social outreach, had always favored closer collaboration with Morsi and he and his allies opposed the military’s coup last week. Ghaffour’s allies include the populist Salafi preacher Hazem Salah Abu Ismail, who was a leading candidate for the presidency in spring 2012 before his disqualification by the Supreme Council of the Armed Forces. Abu Ismail himself is reported to have been arrested on July 5 for inciting violence. Meanwhile, the liberal and secularist movement is more united than it was 18 months ago in light of ElBaradei’s formation in November 2012 of the National Salvation Front (جبهة الإنقاذ الوطني‎) in league with former Arab League secretary-general Amr Moussa and Hamdeen Sabahi, a popular ‘Nasserite’ leftist former presidential candidate. Despite those dynamics, the Al-Nour Party commands the strongest and most committed support within Egypt except perhaps the Muslim Brotherhood and like the Muslim Brotherhood, the Salafi movement can draw on the goodwill that it’s developed over decades through civil society programs that have provided not only religious guidance but support for Egypt’s poor. All of which means that after all the Sturm und Drang of removing Egypt’s first directly elected Islamist government last week, El-Sisi and the Egyptian military may well be putting in place a process that smooths the way for the election of an even more conservative Islamist government.